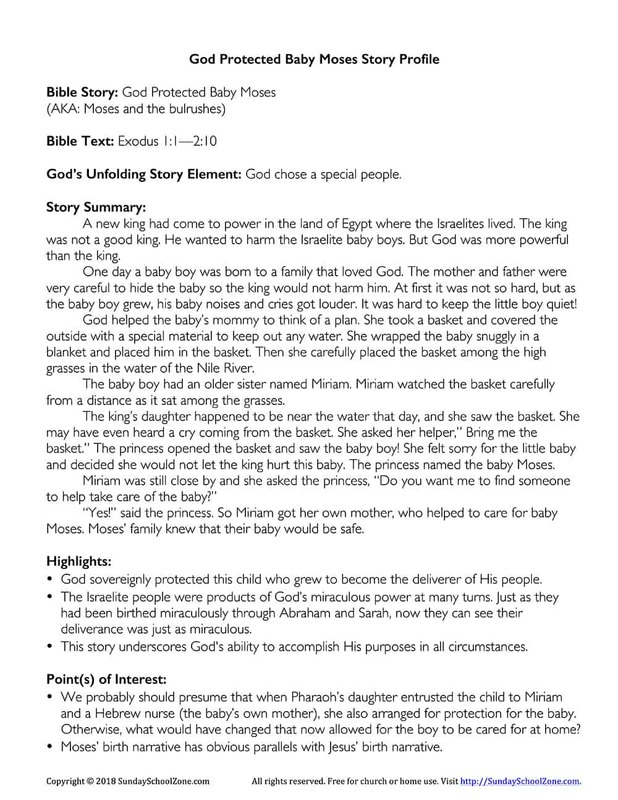 Bible Story Profiles provide a simple overview of a particular story along with Bible story highlights and points of interest based on the text. 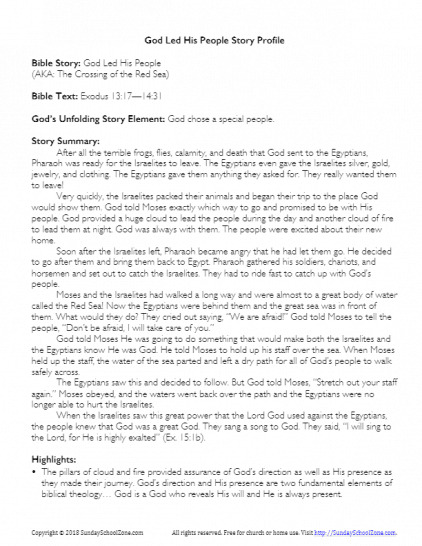 Links to relevant Bible background articles may also be included. 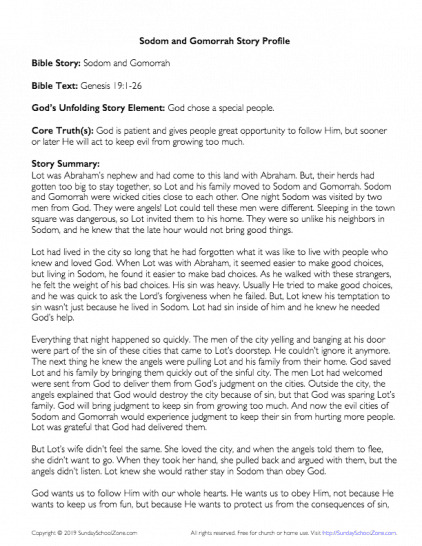 The story summary is generally written for kids, but may include notes for parents/teachers. When possible, we try to provide an approximate date for the event covered in the story. A printable PDF for each profile is also included. 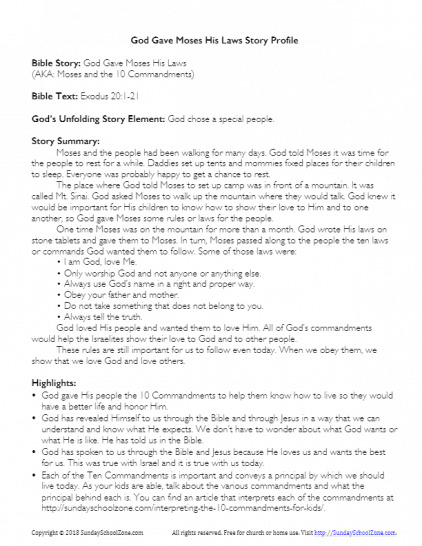 Story profiles are intended to assist Christian parents and teachers of children, but any interested Bible student may find them helpful. The early church was made up almost exclusively of Jews. 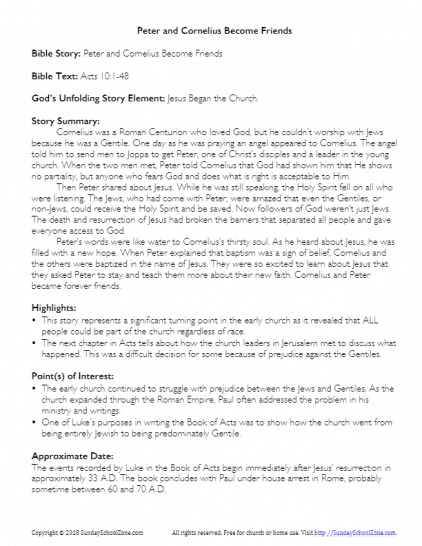 This Peter and Cornelius story profile can be used by a parent or teacher to help kids learn this important story and discover that God sees all people the same regardless of race. The story of Jesus’ crucifixion is arguably the most important story in all of the Bible. 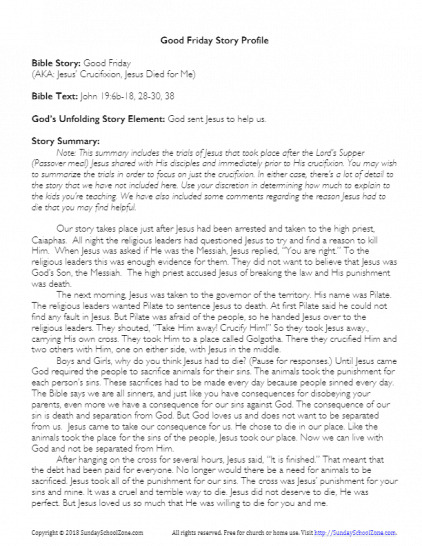 This Good Friday story profile provides a simple overview of the story (for kids) along with highlights, points of interest, and an approximate date for the crucifixion event. 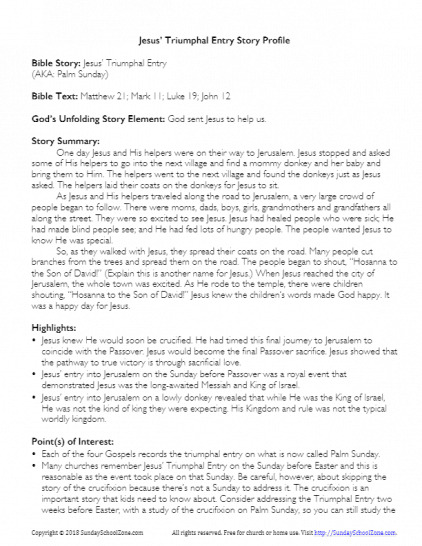 This Jesus’ Triumphal Entry story profile provides a simple overview of the story (for kids) along with highlights, points of interest, and an approximate date for the Palm Sunday event. A printable PDF for this profile is available as well as a link to all related activities. 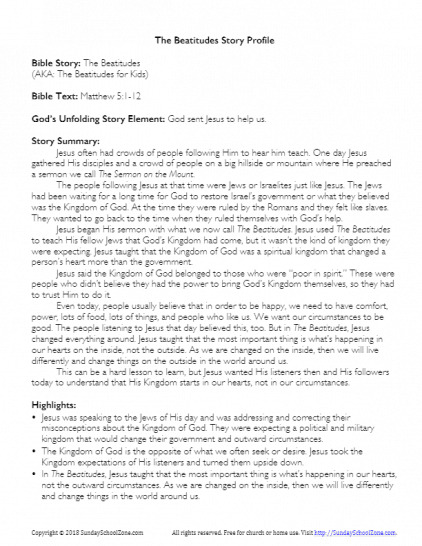 This story profile provides a simple overview of The Beatitudes in Matthew 5:1-12 along with highlights and relevant points of interest based on the text. The story summary is written for kids. When possible, we try to provide an approximate date for the event. 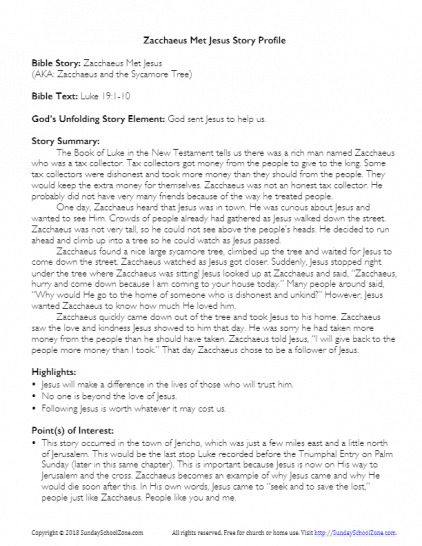 This profile provides a simple overview of the story of Jesus and Zacchaeus, along with highlights and relevant points of interest based on the text. When possible, we try to provide an approximate date for the event for all story profiles. 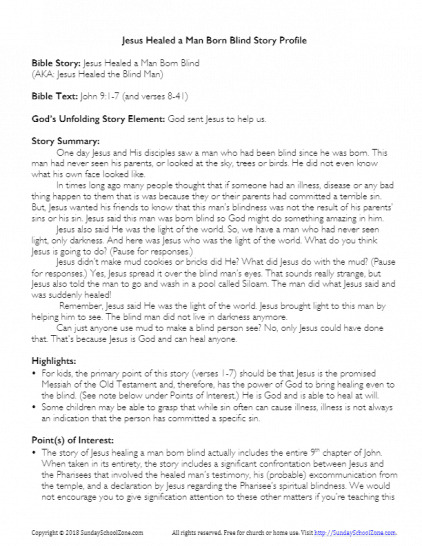 This profile provides a simple overview of the story of Jesus healing a man born blind, along with highlights and relevant points of interest based on the text. When possible, we try to provide an approximate date for the event for all story profiles.